After my little experience on Monday, I realise that I have never worn shoes, although I have a lot of shoes and buy often, I still wear my all faithful on a regular basis and some boxes are left un-open. So I'm putting myself in a challenge I call "no shoe left behind" I'm going to put on a shoe rotation so all my shoes get some play. To get started I put on my bold hat and tried a little pattern mixing! I made this maxi skirt out of Mimi G Style tutorials, it's my favorite skirt to twirl in, makes me feels so sassy and feminine. I'm sure you remember this royalty from it's a royal life and the earrings were a thrifted treasure. Now you get to grade my Dots on Dots attempt. Easy A+! You are print mixing like a pro! You look fab!!! 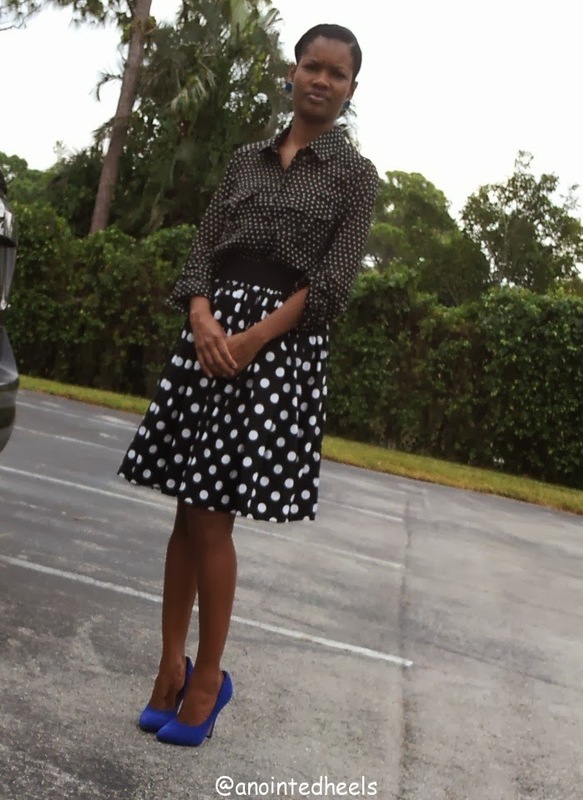 I love the mix on dots and those blue shoes!!! LOVING this look! especially since you made the skirt. That's awesome! I think you did a wonderful job. Can't believe you made the skirt yourself! The blue heels are a perfect pop of color. BTW- This is a great challenge! Thanks Alisha! Always showing me love :) love you girl! Coming from the stylist herself, I'm gonna go pat myself in the back LOL thanks Karen.